Today is the 62nd Anniversary of the reign of Queen Elizabeth II. Her accession to the throne began on February 6th, 1952, upon the death of her father, King George. Her Grandmother, Queen Victoria, reigned for 63 years. When she became Queen she became the constitutional monarch of 16 sovereign states, known as the Commonwealth, and their territories and dependencies, and head of the 53-member Commonwealth of Nations. She is Supreme Governor of the Church of England and, in some of her realms, carries the additional title of Defender of the Faith. Quite a bit of responsibility comes along with that crown. Countries for which she is the Queen are – United Kingdom, Canada, Australia, New Zealand, South Africa, Pakistan, Ceylon, Jamaica, Barbados, the Bahamas, Grenada, Papua New Guinea, the Solomon Islands, Tuvalu, Saint Lucia, Saint Vincent and the Grenadines, Belize, Antigua and Barbuda, Saint Kitts and Nevis. 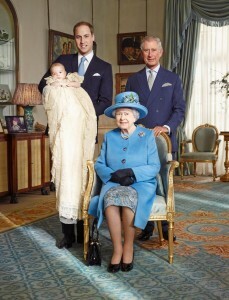 With the birth of Prince George in 2013 the future for the Royal Family looks strong.